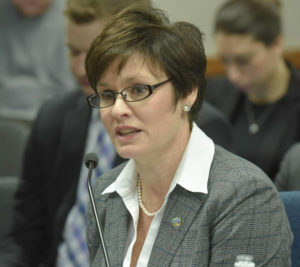 Testifying Monday before a House budget hearing, Missouri’s new Department of Corrections Director Anne Precythe says she’s committed to not building another prison. She says the department will instead look to reduce prison populations before expanding the system. With numbers going up and down each year, Director Precythe describes the prison population as a “rollercoaster,” though overall it has been rising. Last year it rose by around 550 inmates, she said. Since 2006, Missouri’s prison population has risen by around 2,500. Missouri prisons currently hold about 32,500 inmates. Missouri last built a prison in 2008, the new Chillicothe Correctional Center. It cost the state roughly $120 million dollars and was paid for through bonds authorized by the Missouri Legislature in 2006. This year’s budget included funding to pay for the last Chillicothe housing unit. The new facility was built to address Missouri’s rising female prison population and currently houses around 1,700 inmates. If Missouri lawmakers decide to build a new prison, DOC Budget Director Joe Eddy testifies that would take about four years. State Rep. Scott Fitzpatrick (R-Shell Knob), who chairs the House Budget Committee, says he’s worried that crowded prisons might turn Missouri’s criminal justice system into a revolving door. Director Precythe testifies that she wants to reserve prison space for Missouri’s most dangerous criminals.